There is now a hackathon for dentists. There is a hackathon for Boston baseball fans, and another to promote video games about motherhood. Perhaps an image just popped into your mind of Fonzie on water skis jumping over a mechanical shark. That is fine. Once an underground activity by actual hackers, hackathons have morphed into a strange amalgam of partying, social activism, and a way for corporations to gain product ideas and source code on the cheap. “Hackathons are evolving,” said Nicholas Eisenberger, a partner at Pure Energy Partners, which functions as a matchmaker between small startups and large investors. Eisenberger is also co-founder of The Cleanweb Initiative, which sponsors hackathons around the globe. As we enter a new season for hackathons, with big competitions in NYC, Boston, and San Francisco slated for next month, we examine some of the success stories of last year’s contests. Such stories are actually somewhat rare because, as many investors have noticed, hackathons aren’t always the most fertile ground for startup businesses, especially not ones with sufficient growth potential to attract venture investment. Even as the timeframes of hackathons expand to 48 hours, or even month-long competitions, it’s usually still a group of people thrown together almost randomly who must quickly figure out how they can attack a certain problem or data set, write the code, and create something that actually works on a real computer by the end of the event. “It’s intense, it’s social, and the apps give you the chance to strut your stuff,” Eisenberger said. Most startups, including most that begin at hackathons, never figure that out. Look at the winners from the 2013 Boston Cleanweb Hackathon last April. The winner, Bulbtrip, described itself as “Zappos for residential lighting.” Catchy. But today it does not exist. The same is true for second-place GreenCaptcha, third-place JCube, and the judge’s favorite, Open Buildings Initiative. No websites. No outside investments. 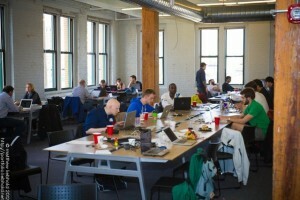 Which begs the question: Are hackathons a bad way to start companies? And yet. Rather remarkably, hackthons have provided the birthing room for a number of real, actual companies. SolarList, which won $20,000 by winning the award for best cleanweb app at last year’s NYC BigApps Competition, raised $155,000 in its first round, and now is coming back for another $750,000 of angel investment for its software that estimates the cost of switching homes to solar. Mario Batali, the restauranteur and celebrity chef, may yet outlive his reputation as a tip-stealing cheapskate by participating in MintScraps, an app to help restaurants minimize food waste and identify potential inefficiencies in their operations in real-time, which came in second at NYC BigApps and is winning lots of attention these days. The app is currently used at a number of Batali’s New York City restaurants including Eataly, Del Posto, Casa Mono, Tarry Lodge, and OTTO. Still a self-funded project by founder Tony Vu, MintScraps plans to seek outside investment “in the future as we scale,” Vu says. Here are some companies that started at cleanweb hackathons in 2013, and that now appear to be gaining traction and investor interest. Despite the hackathon’s roots in computer code, some of these companies make actual, physical things. Others address more traditional software and data challenges, focused on locating untapped efficiencies and helping individuals better manage resources. Empowering people to meet their needs while using less energy is a natural avenue for hackathon-generated companies, since such ventures rely on mature technologies that most people carry with them already, especially the smartphone. An obvious way to help startups do that is for governments and large corporations to make their huge data sets available to programmers and entrepreneurs. Open data was one of the big draws at NYC BigApps, in which New York’s Bloomberg administration opened the doors to databases collected by many of the city’s agencies. The same is true with the Department of Energy’s Energy Data Jam Challenge, which in Boston made use of Enernoc’s open data initiative, and at the SXSW Eco Hackathon, which gave developers access to household energy use data from Pike Powers Lab. Whatever the source, open datasets are often the unseen driver of successful hackathons, since they provide the raw materials needed to build cleanweb tools and test to see if those tools work. That helps solve the primary problem that many would-be entrepreneurs face: Simply finding the right sources of good, usable data so that they can begin sifting through it. “If there’s one location where all this data was, the good, quality data filtering and data analysis will rise to the top,” said Jon Roberts, a research scientist at New York University who participated in the team that pitched clean.data, a startup idea that won the DOE’s Energy Data Jam Challenge in New York last June. Two other successful data tools include CrowdComfort and WattTime. CrowdComfort, winner of the DOE’s Energy Data Jam Challenge in Boston last April, raised $300,000 in seed funding in December to continue building an app that allows people to report maintenance and HVAC issues to building managers instantly using their smartphones. There may be more funding on the way now that the company was selected as one of eight energy technology startups that pitched at the ARPA E-Energy Innovation Summit in February. The company’s tools have been implemented at seven major sites around Boston, including a GE facility—its first paying customer, says co-founder Kevin Loos. It will participate in another cleanweb hackathon in early April at Boston’s Greentown Labs, where Loos says the company will have its official product launch. And for anyone interested, “We are in the process of raising a second round of capital,” says Loos. The insight driving WattTime is even cooler. While top-down energy market deregulation gave us rolling blackouts across California and little real consumer choice, WattTime proposes a bottom-up approach that empowers people to choose renewable electricity by telling them when that energy is most available. The company won $500 at the Berkeley Cleanweb Hackathon last April for “best use of green button data.” By monitoring the percentage of electricity coming from coal, natural gas and nuclear plants versus solar and wind, and predicting short-term demand, it also helps people plan the best time to perform electricity-heavy tasks such as laundry or running the dishwasher. Currently a nonprofit, WattTime says it’s planning to create a related for-profit entity (which presumably will need investors). 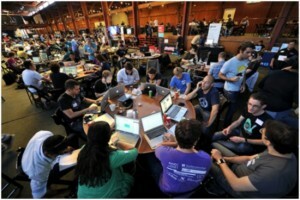 Another hackathon-friendly arena for startups is helping consumers achieve better resource efficiency. Like SolarCity, SolarList is touting its ability to cheaply and quickly predict the costs of residential solar installation. One way it’s doing it is by recruiting teams of “activists and students” to go door-to-door selling their services, which sure sounds like a euphemism for “underpaid sales force.” Potential labor law violations aside, SolarList’s website does includes this funny video imagining a bunch of VC’s chopping Nikola Tesla’s inventions to shreds. Another startup in this field, and a rare B2B player, is Sunride Analytics, which offers an app comparing drivers’ current cars to the cost of buying a new electric vehicle and parking it under a new solar carport. The idea won the $2,000 price for best technical application at the Oakland Cleanweb Hackathon last June. Rather than recruit impressionable 22 year-olds to sell directly to homeowners, Sunride plans to sell its product to car dealerships. Now that seven states have passed rules requiring that 15 percent of all cars sold by 2025 must be electric-powered, and most of the EV’s currently available resemble very expensive potato bugs, dealers trying to sell them will need all the help they can get. Another idea generated at Oakland that is gaining traction is PowerHive. The founders pitched a predictive service that helps people in developing countries that rely on solar power to predict cloudy weather that may limit solar energy production, and to plan their electricity use accordingly. The company has expanded since then, according to its website, keeping the predictive software and adding tools to finance and meter new distributed solar microgrids. Most products of hackathons are apps that need to interact with the physical world, but some actually inhabit that world. One is Urban Sunspot, a neato solar-powered, self-contained station for charging electric bikes, laptops and cell phones. Its central tower even resembles an old-fashioned gas pump. The company grew out of the Hack City San Francisco hackathon last September, and it has installed five stations so far. How do the stations “make money?” Honestly, we’re not sure. It’s hard to imagine people paying extra for electricity from an outdoor station when they could simply walk to the nearest coffeeshop and plug in. The current locations, which include two colleges, a bike shop, an art festival and a business consortium, may provide a clue about the potential market. 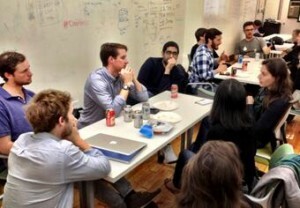 Did we miss any rising Cleanweb hackathon stars getting traction in their respective market? Please let us know by emailing – msalat@cleantechiq.com. We look forward to highlighting more potential early stage deal flow opportunities for VCs and angel investors after the next round of hackathons this spring. So stay tuned!